In our previous posts we have discussed lots of Gmail tools and addons such as Boomerang to schedule emails, RightInbox to see who see your emails and when and lots of other Gmail apps and tips. 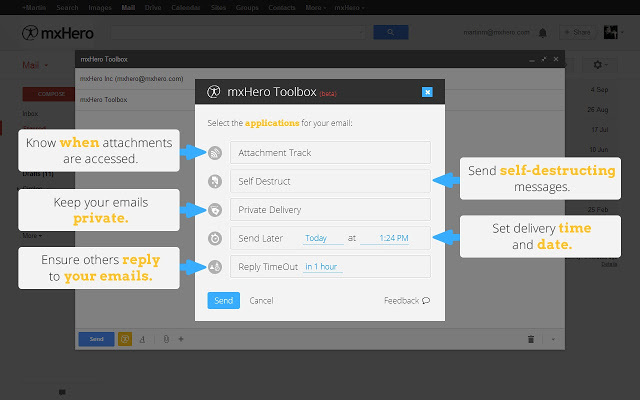 Today we found a new Google chrome addon called mxHero Toolbox, an addon powered with lots of free Gmail tools. With the help of this free addon you will use so many features on your Gmail inbox such as Self Destructing Email, Send Later, Track emails, Track Attachment Delivery and more. All the above mention feature are missing on the Gmail Inbox account, but with these addon you will enjoy all of them at one place. All you hvae to install this addon your chrome browser and you will enjoy these feature on your inbox. Currently the addon is available for the Google Chrome browser users and you will download the addon from the Google Chrome web store or you will find the download link at the end of this guide. Once the addon is installed on your browser, login to your Gmail account and authorize the app to access your Gmail inbox. Now, click “Compose” button and on the compose window you will see the new Yellow color MXToolbox icon next to the Send button. 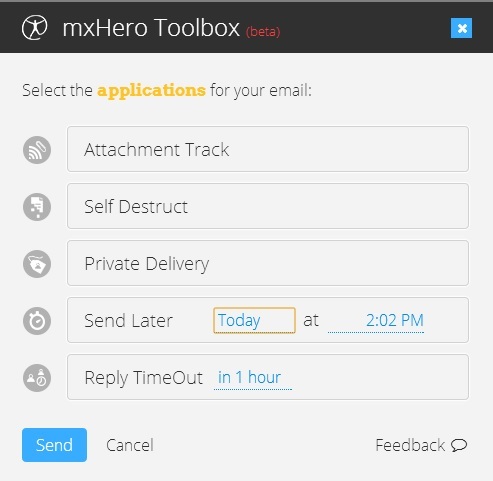 You can select multiple option form the list, for Send later and Reply TimeOut tool you have to mention the time. Now hit the send button to send an email. Once the email is received in the recipient’s e-mail address, you will get the notification on your inbox and after 5 minutes the email will Self destroyed and the recipient will not see the email contents. Currently the tool support Gmail inbox only and Free for up to 3 email addresses of Google App domains. Download the addon from below mention link.